Not a single one this week. Uh oh! Ahhh, you guys! I'm so busy with school. I'm still making time to read (whew!) but the blog has taken a bit of a hit. I need some time management tips. Or perhaps a time turner? I hope you've all had a fab week! What's happening with you? What are you reading? It's very hard to maintain blogging and family life! I feel ya! I have been blogging about other things but behind on book reviews as usual. I'm currently reading Thrity Umrigar's memoir First Darling of the Morning. She's one of my favorite Indian authors and its a non-fiction that reads like a fiction. If you haven't read it, I think you'd enjoy it. I'm reading it as part of Savvy Working Gals' nonfiction book club. I have been trouble accessing and commenting on your blog from my phone for some reason. :( But I've been visiting! I didn't know you were doing a link up thingy :) Have you for long? I haven't made time for blog reading in so long :( That speaks directly to my lack of time lately...sigh. I feel like I've read Umrigar before but I'm not sure what title. Hmmm. I adore nonfiction so I'll definitely look that one up! You are very busy! Perfectly understandable if it's tough to juggle everything. How do you like The Luminaries? I keep hearing good things about Wake too. I keep telling everyone that it's a very dense read. You know the type...when you have to pay close attention to every sentence? I'm really enjoying it though. It's full of interesting characters. Oh girl. When I was in school I rarely read outside of my classes (though with so many Lit classes I was sometimes reading a 1,000 pages a week). Thankfully I didn't have the pressures or distraction of blogging/social media back then but I played SO many Sudoku puzzles to give my brain a break. Just allow your brain to do what it needs to do!! I'm so curious about Luminaries but I don't think MY brain could handle it right now! Hope you have a great week. 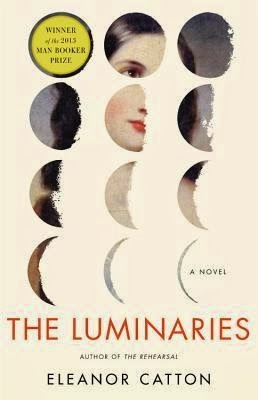 The Luminaries is good but whew, it's one of those chunky chunksters that need ALL of your attention. I suppose you don't ;) I understand the sentiment though! You're completely correct :D I need to relax and realize that I can't do it all! Hey, at least, we're getting to see you here now. We'll take it. Thanks for checking in for us. We appreciate it. Happening with me? Eh, not much. A little reading, hopefully this afternoon. A little watching of Downton Abbey tonight, maybe. We'll see. It's easy like a Sunday morning...well, now afternoon. Downton makes Sundays so lovely doesn't it? Now that there is no football to watch Sundays can be a drag for me, lol. Thanks DA!! Right?? SCIENCE, get to work on this! When you find the time turner, let me know - I could use it as well! You are definitely reading a lot - the reviews will come! The reviews will come...or they won't. Ha! Time will tell! 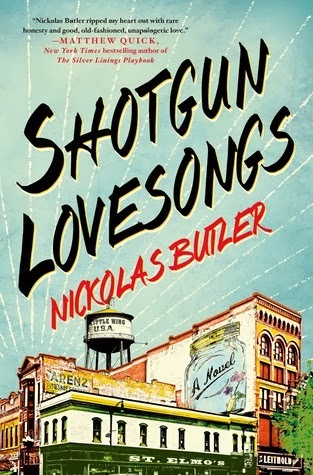 I was wondering if you were going to read Shotgun Lovesongs with all of its Wisconsin connections! I just picked it up yesterday, so far so good. We read the same things so often, and usually right around the same time. ;) Great minds! And of course I have to read this one with all of the Wisconsinness going on! Reading Wake, which you have as upcoming. I have a friend listening to audio of The Luminaries right now. She said it's pretty long audio! Good so far? Glad you are still able to squeeze some reading in...school can't last forever, just do what you can when you can. How are you liking Wake, Jennine? I'm looking forward to it! The Luminaries is definitely a chunkster. It's over 800 pages...whew! I liked Wake - review going up this weekend. I know what you mean. School is taking over my life too. I think we need a time turner. ;-) Have a good week. I'm too old for this stuff, lol. You have a good week too! I feel like reading/blogging is really hit or miss, depending on what is going on in my classes during a particular week. Last week was very intense for me, and I didn't have any time for anything extra or fun. :( I have a set schedule for when I do my assignments, and its like I am back in grade school. I go to work all day, then when I get home at 3, I immediately start on my assignments, and work on them until my husband gets home at 6. If I finish before 6, I will blog. That is my time for any sort of writing/work stuff. The rest of my time is spent with my husband and doing household things. Shotgun Lovesongs sounds really good! Can you believe how life dares to get in the way of our reading and reviewing?? ;) I'm plugging away at The Luminaries right now and I'm really enjoying it. You're a professional student! That sounds like what I'd like to be when I grow up ;) I love the learning but I'm having a hard time balancing things lately. I'll get into the swing of things soon...I hope! The Luminaries sounds so good but I'm not sure I'm up for another giant book just yet. I hope you are enjoying it. One book that I would really like to read this year is We Are All Completely Beside Ourselves by Karen Joy Fowler. 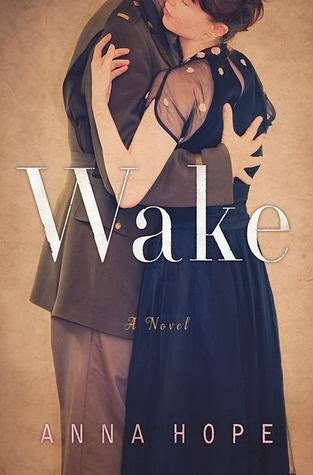 I have to gather some energy before reading The Luminaries ;) I'm really looking forward to your review of Wake and Shotgun Lovesongs (love that cover). I've read nine books last month but now I'm slacking both in my reviews and reading! I really enjoyed that one, I bet you would too. :) I stayed away from spoilers and it was a surprising read. Time management hints? No TV. You give up a TON of reading/blogging time with TV, even if it is on in the background. Write posts during the time of day in which you are most awake. For me, that is during my lunch break. I write better and more quickly during the day than if I try to force something at night. The other thing is not to force it. If it is taking forever to put your thoughts into words, try it some other time. Schedule posts in advance. This is a huge one and makes life SO much easier. You can set aside some time each weekend and schedule posts for the week or just start writing each day and scheduling reviews as soon as you finish reading them. By doing this, I have posts scheduled a month in advance. It helps me so much when life gets busy and I can't find the time to squeeze in some writing. Find an app like Evernote that syncs between phone, laptop and tablet. That way, if you have a thought about a post or a review, you can jot it down on one device and come back to it on another. If I think of any more, I'll let you know. Good luck! I understand completely. It took me about a year to realize that writing reviews or posts after work was just an effort in futility and all but a waste of time. Now, my evenings are spent with a little blog maintenance (updating links with the day's review, updating Goodreads and Pinterest) and answering emails and comments. An hour tops. The rest of the time, I'm reading or working on other household chores that always need doing. Most of the time, it's reading. I can't tell you the last time I watched a TV show or movie. You'll definitely find your rhythm. I used to watch a lot of TV too. Once the kids started getting so busy, I found I would rather read and relax than watch TV and relax. It became all about priorities for me. You'll find yours and get into a routine. I promise! Meanwhile somebody creates one, I'm dealing with multitasking and trying to be more organized! And I did another whole lot of nothing this week. Sigh! Hi-ya. When I read your profile on SheReads, I knew I had to visit your blog. After visiting and nosing around, I knew I had to follow. Count me in as your newest groupie. Nice to meetcha.